We live in dangerous times, live right and be prayerful always. 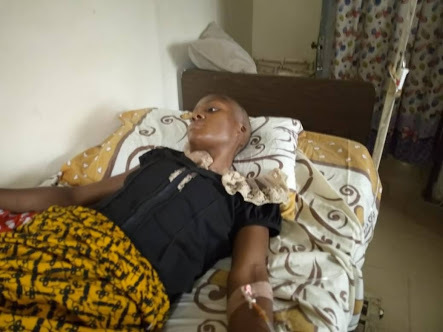 The lady pictured above is lucky to be alive, after she escaped being used by Ritualists Last week Friday. 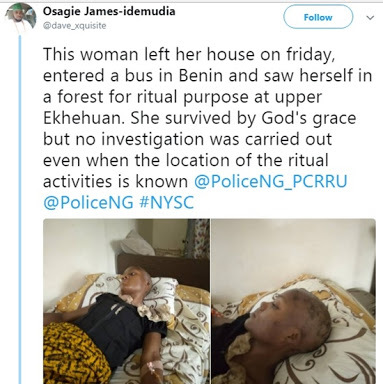 According to Osagie James who shared the story, the lady had boarded a bus with others in Benin, but the bus diverted and took them inside a bush to butcher them for ritual. 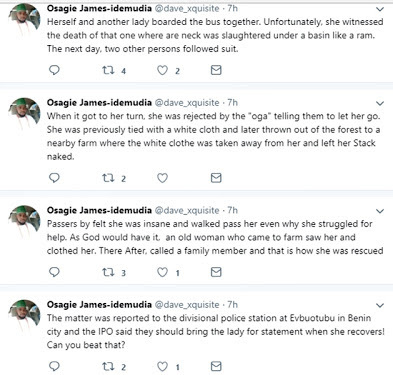 But when it got to her turn the 'Oga' reportedly rejected her and they left her to die. She was however rescued by an Old woman who was on her way to farm. She's currently admitted in a Hospital.